Yon timoun ki lekòl se benefis tout moun (“a child who goes to school benefits everybody”) is a well-known Haitian proverb that speaks to the tangible and intangible value of an educated child. Through education, Haitian children can learn to understand the world about them, rise out of poverty, and bring solutions to their homeland, starting a ripple that eventually reaches outside their borders. 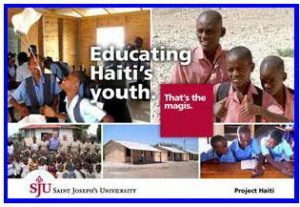 The Saint Joseph’s University Project Haiti Committee recognizes the benefits of educating Haiti’s youth. 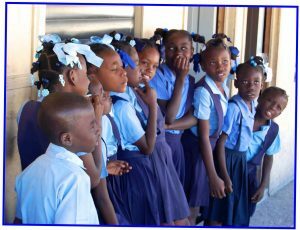 They are helping to ensure that every child who wants to attend one of the Foi et Joie schools, sponsored by the Society of Jesus in Haiti, has a uniform. SJU Project Haiti has entered into a formal partnership with the Foi et Joie schools. The uniforms, which are mandatory for attendance, cost $30 each, which may seem inexpensive but in a country where the average worker earns $2 a day, the cost can be prohibitive. The gift of a uniform provides the opportunity for education for many children who would otherwise be unable to attend. Fill out your name, email, and donation amount. Complete the form, providing your billing information and confirming your donation.